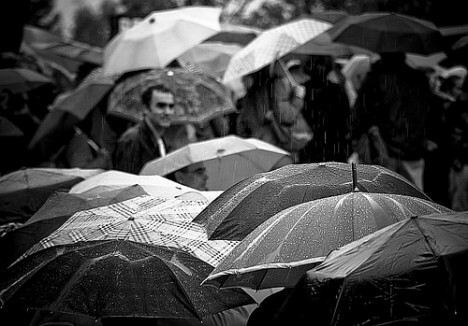 Statistics vary slightly, but most weather sites agree that the median number of rain days in London, UK sits somewhere between 140 and 150 days annually. This translates into big business for the umbrella manufacturers of the world. In the United States alone, it is estimated that over 33 million are sold annually and that the average household owns 3.8 umbrellas. Those stats would likely be much higher in a country like the United Kingdom that is notorious for having a damp climate. Despite this demand, umbrella design hasn’t changed much in the last thousand years. Materials have evolved (most umbrellas are no longer made of paper) and more compact, purse-friendly designs have been introduced. Still, there has been very little innovation in terms of making the umbrella impervious to its biggest foe, the wind. In 2007, “out of pure frustration with traditional umbrellas”, a university student named Gerwin Hoogendoorn was studying industrial design in the Netherlands when he invented the Senz. This new umbrella is similar in shape to a bike racing helmet and is meant to be flexible and adapt and shift in the wind. According to the website is can withstand gales of up to 100 km per hour, which seems to be backed up by the ridiculous number of awards they’ve won including the 2008 International Design of Excellence, Times Best Innovation of 2007 and the Red Dot Design Award 2007. They also reinforce their claims up with some ridiculous videos of people testing out the Senz by doing things like wake boarding while holding onto one. The Senz isn’t available in UK shops but can be purchased online from the Senz site for almost €50 each plus about ten extra for shipping and handling – very high considering that a cheap umbrella can be bought on nearly every corner in London for under £5. The price is obviously justified by the higher quality and durability, but does it come with a tracking device in case I leave it on the Tube?